Do you remember console TV's? Your parents, or maybe even you yourself, owned one. Admit it. We know you did. My mom owns one and it still works, too! Once the television part of it does finally decide to cash it in, I know exactly what she should do with it. She should turn it over to Angie from Miss-Tints. She transforms them into something pretty spectacular. She collaborated on this project with her friend Cindy. Cindy had the TV and removed all of the electronic parts of it. Then she turned it over to Angie to work her magic on it. Angie says that she tries to keep her budget low when working on new pieces. To that end, she limits her out of pocket expenses and one way she does that is to buy only mis-tint paint. Hence her business name, Miss-Tints. I LOVE that! So clever! Are you ready to see what she did to this TV? Call your doggie over because he is gonna want to see this, too!! 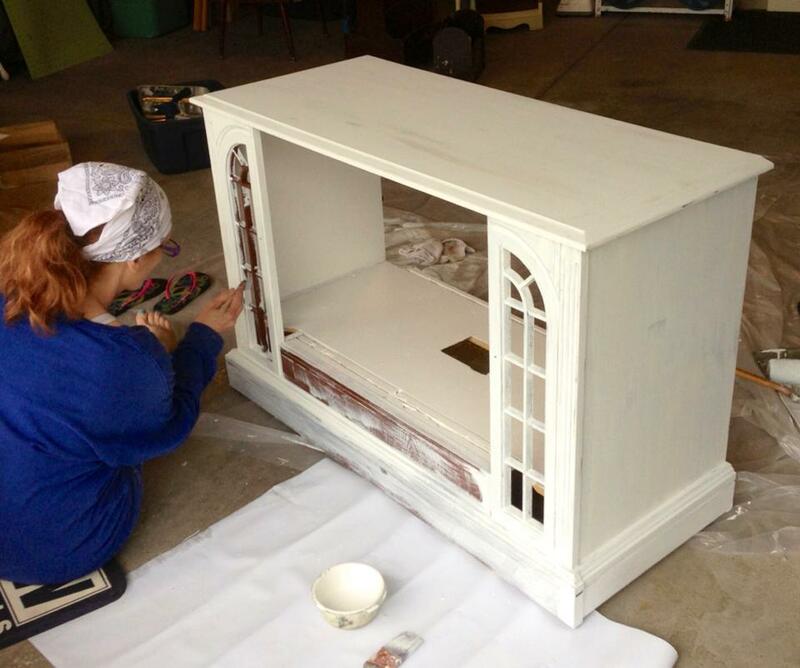 Angie aka Miss-Tints is located in the Indianapolis, Indiana area and loves to repurpose old furniture. Check out her Facebook page to see more of her work, give her a "like" and let her know you saw her here. 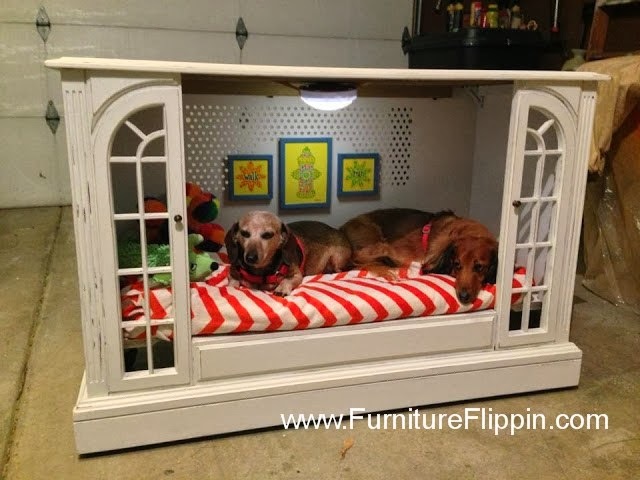 Thanks so much Angie for sharing your very unique furniture flip! Thank you! No I dont mind, they are fun and easy!! Hi Angie, you've created an adorable trend! The 2nd hand store said that I was the 2nd person to buy one on their consoles for this. Did you use something to remove the varnish or did you sand it down? LOL, well that's exciting to hear, but shhh...I stole it too. Did you happen to shop at the Salvation Army in Indianapolis? WOW! Wish my husband would have done this to our old wooden consol TV! Great Job Angie! SMART,GREAT JOB .NOW I HAVE TOO FIND A CONSOLE TV FOR OUR 3 DOGS.NEED SOME HELP.DESPERATE DOG OWNER FROM Pa.